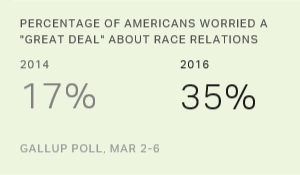 WASHINGTON, D.C. -- More than a third (35%) of Americans now say they are worried "a great deal" about race relations in the U.S. -- which is higher than at any time since Gallup first asked the question in 2001. The percentage who are worried a great deal rose seven percentage points in the past year and has more than doubled in the past two years. Concern about race relations in the U.S. has risen during an 18-month period marked by a series of deaths of unarmed blacks at the hands of police officers. These deaths sparked major, sometimes violent, protests and fueled the nationwide rise of the "Black Lives Matter" movement. Concern about race relations over the past two years has increased among Republicans and Democrats, conservatives and liberals, and blacks and whites. But the gap between the groups who were already most worried before 2015 -- Democrats, liberals and blacks -- and those less worried has not shrunk, and in some cases has widened. Of particular note is the 53% to 27% "worried" gap between blacks and whites, up from the 31% to 14% gap between blacks and whites in the 2012-2014 combined polls. 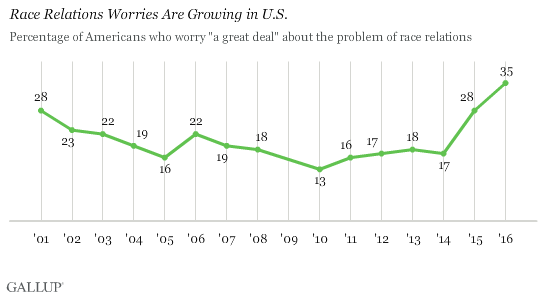 Percentage Who Say They Worry "a Great Deal" About Race Relations in the U.S. Prior to 2015, race relations was much less of a concern to Americans, relative to other national issues. In almost every one of 13 polls from 2001 to 2014, Americans were significantly less likely to be worried about race relations than about any of the other dozen or so issues tested. Even this year, though the percentage concerned is up, race relations still ranks near the bottom of the list of concerns, along with energy, climate change and illegal immigration. None of the four elicited a great deal of concern from more than 37% (illegal immigration) of the public, compared with more than 50% for healthcare, the economy, and crime and violence. Race relations may not worry as many Americans as do issues such as the economy, affordable healthcare or crime, but Gallup's polling clearly shows that racial tensions over the past few years have significantly affected public opinion. Not only are far more Americans -- no matter their race or political beliefs -- worried about race relations, Americans have also become less satisfied with the way blacks are treated and more likely to list race relations as the most important problem the nation faces. The rising concern about race relations as the nation's first black president completes his last year in office is a retreat from the optimism that swept the country in the immediate aftermath of President Barack Obama's first election win in 2008. A Gallup poll one night after Obama won found that seven in 10 Americans believed race relations would improve because of his victory. In fact, a mid-2015 Gallup poll indicated that treatment of blacks had not worsened during Obama's time in office, even while concerns about race relations and treatment of blacks were rising. However, the poll also did not show any significant lessening of perceived racial discrimination among blacks. In the current presidential election cycle, both conservatives and liberals have attacked Republican front-runner Donald Trump for his campaign's racist overtones, and conservative pundits are already claiming that history will conclude the Obama presidency worsened race relations. These factors, along with the ever-growing number of racial protests on college campuses and elsewhere, make it unlikely that Americans' concerns about race relations will diminish in 2016. Midwestern and Northeastern states score well on Gallup's Law and Order Index, compared with Southern states. Differences in racial attitudes help explain variations in confidence in local law enforcement and perceptions of safety. Less than half of Americans, 47%, rate black-white relations in the U.S. today as good, down sharply from 70% in 2013. Blacks and whites show similar drops. Americans' long-term outlook for black-white relations is unchanged.